Relax by the water at Burleigh Head National Park and Coolangatta Beach. Head to Pacific Fair Shopping Centre and Harbour Town Outlet Shopping Centrefor plenty of shopping. Venture out of the city with trips to Tweed Regional Gallery & Margaret Olley Art Centre (in Murwillumbah), Darlington Park (in Darlington) and Glow Worm Caves (in North Tamborine). There's still lots to do: kick back and relax at Surfer's Paradise Beach, look for all kinds of wild species at David Fleay Wildlife Park, make a splash at Dreamworld, and stroll through Currumbin Wildlife Sanctuary. 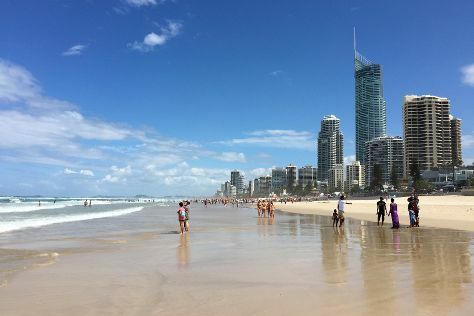 To find more things to do, traveler tips, maps, and other tourist information, use the Gold Coast tour itinerary planner . If you are flying in from Singapore, the closest major airports are Brisbane International Airport and Gold Coast Airport. In November, plan for daily highs up to 30°C, and evening lows to 20°C. Cap off your sightseeing on the 29th (Thu) early enough to travel back home.